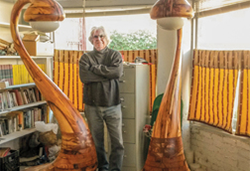 Internationally recognized furniture-maker Sam Forrest (B.S. '63) created the Forrest-Edwards Fund for Spirituality, Nature and Sustainability in the Virginia Commonwealth University College of Humanities and Sciences' School of World Studies' Religious Studies Program. His planned gift, given in honor of Cliff Edwards, a friend and longtime VCU faculty member in religious studies, allows students to benefit from special lectures, travel abroad and other educational programs. "This generous gift supports educational initiatives that promote sustainability and a love for nature, two goals that are close to Sam's heart and about which he is deeply committed," said Mark Wood, Ph.D., director of the School of World Studies. "We look forward to building the fund and an environmentally healthy city for all." Forrest is a member of the VCU Heritage Society, which honors donors who have made provisions for the Monroe Park Campus in their estate plans. In addition to this latest gift, his bequests include funding for music orchestration studies, lectureships in woodworking and furniture design in the School of the Arts and a lectureship in religious studies.